Quick review of Bee Happy. I don’t know how to describe Bee Happy. However, what I do know is that it’s an absolute abomination of a "game" that delivers less fun than winnings, and I’ve been a steady loser at the game since I started playing it. 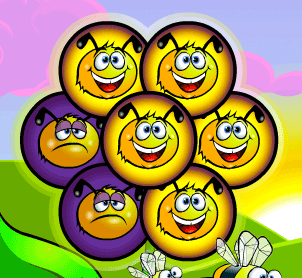 Bee Happy involves 7 spinning "reels" that will either display a happy bee or an ill/sad bee after each spin. If a happy bee is displayed, the reel is fixed whilst the remaining sad bee reels continue to spin for further rounds. The more rounds you can go through without having all 7 reels display a fixed happy bee, the more money you will win. I know, it hardly makes sense at all, but there we go. Bee Happy fun rating - 5%. Bee Happy is not a fun game. That’s the long and short of it (and every conceivable measurement in between). Bee Happy requires no skill. There is virtually zero interactivity. Bee Happy combines all the elements that make up a terrible game and slaps some stomach-churningly childish graphics and audio over the top. I don’t understand how Bee Happy is classed and offered as a game at all. Bee Happy is not a game you play, it is something that you have the misfortune of subjecting yourself to and wasting money on. How to play Bee Happy. The basics of Bee Happy. Bee Happy in more detail. 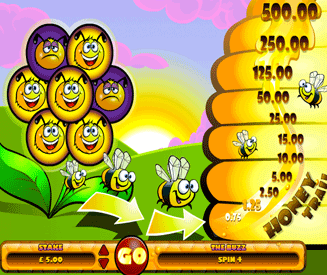 The main focus of the Bee Happy online game is the 7 circular panels. These 7 panels can display a happy bee or a sad bee. During each round, each panel will spin and stop on either one of the two different panels. Happy bees will fix the panel and will no longer spin on future round. Sad bees will not fix the panel and will continue to spin on future rounds. The aim of the game is to continue through as many rounds as possible. Obviously you want to avoid seeing happy bees as these will fix the panels and reduce your chances of progressing up through the money ladder. 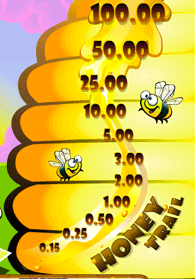 The more rounds you pass through, the more money you will be able to win by moving up through the "honey trail". The game finishes when all 7 panels display happy bees. If anything, seeing as the game is called "Bee Happy" this seems pretty counter intuitive, but then who am I to argue with such an epic game. Each round will multiply your initial stake by a certain factor. The round you finish on will determine your final win multiplier. Multipliers are not added together. Fact: The first 2 rounds do not offer any wins. You actually need to make it to the 6th round to break even. Bee Happy bonus round and features. Only joking. There are no bonus rounds, features or anything close to resembling something remotely fun or entertaining in Bee Happy.